Los Angeles residents driving near the area of Robertson and Cadillac might notice a new unusual advert on the billboard at 2363 S Robertson Blvd. There is then a QR code and a plea for viewers to send “The Bitcoins” to this address represented by the QR code. In fact, the billboard on Robertson isn’t the only Bitcoin Billboard to go up in the last two days. Two days ago, redditor /u/btchappy snapped these photos of the exact same billboard going up in Eagle Rock, off of Colorado Blvd. This billboard is near metro public transportation as well as a major highway artery so it definitely gets a lot of views. This might explain the currently 0.3072 Bitcoins sent to the address thus far. At a current market value of around ~$210 whomever put up the billboards has yet to make back their investment, but then again it is only the beginning of the first inning. Many redditors have noted that anyone rich enough to buy out billboard space in the first place shouldn’t be receiving donated Bitcoins to begin with(Poor writers on the other hand could use a few Satoshis: 16thSoEhMpeY1AhM3jxLYCPN1SvShtq8Ax). 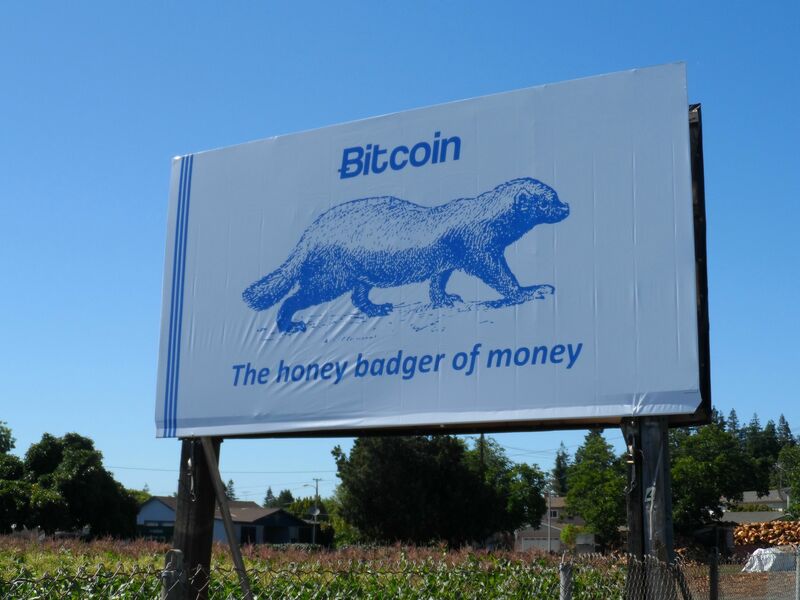 Everyone remembers the first Bitcoin billboard of all time to go up earlier this year in Northern California near San Jose: The Bitcoin Honey-Badger. This billboard was brought to the community and international acclaim by none other than Roger Ver aka “Bitcoin Jesus”. It is not yet clear if Roger Ver is also behind this latest string of Bitcoin billboards, but I am fairly certain that he is not. Given the blatant begging and rampant self-promotion in the billboards, this “investor” was likely inspired by a college football sign netting in over $20,000 after just a little bit of airtime on ESPN’s College Gameday. The true secret was the image going viral on /r/Bitcoin and then the actual maker of the sign revealing himself and promising to donate the funds to Sean’s Outpost, which has actually happened. Until such time that the person behind these shameless Bitcoin billboards does the same with a similar pledge and unmasking of identity, it is unlikely that these Bitcoin billboards will actually rake in more Bitcoins than they cost. However, i feel that the accompanying publicity is inevitable and there really is no such thing as bad publicity when it comes to Bitcoin. Anyone who turns away from a new idea because of a sensationalist headline is intrinsically unlikely to take to said idea anyways. If you’re in the Los Angeles area, let us know if any more of these shameless Bitcoin billboards pop up. If you’re the man or woman behind these billboards, reveal yourself! The community is eager to meet you.